It is laughable that the Ontario Liberals are scolding residents of the province for not putting enough away for their own retirements when the Government has so chronically underfunded it's own defined benefit pension plans that they look more like Ponzi schemes than retirement benefits. Ontario has short changed it's own obligations to provincial defined benefit pensions by $75 billion dollars -- a tab the taxpayers will have to pick up if we are to prevent Ontario from taking it out on individuals who rightfully expect to be paid what they are owed. 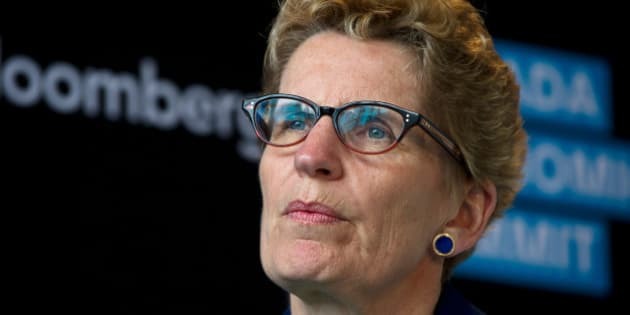 For Kathleen Wynne and her cabinet to suggest employers who do not offer rich pension plans have caused this crisis in savings among retirees, when the province itself has not sufficiently funded its own pension plan for its workers would be laughable if it did not indicate a significant blind spot in logic. If businesses tried to do with private pensions what the province is doing with public pensions, they would go bankrupt. The Ontario Retirement Pension Plan the Government is poised to levy on income earners in the province will see taxpayers relieved of up to $1,710 of their income each year and likely closer to $3,420 for those who dare to own their own business and put themselves on payroll. This money will be invested in whatever schemes the financial aces appointed by the Government opt for and will pay out $13,500 per year to someone who has put in the maximum for 40 years. Over 40 years, an employer and employee would put in $136,800 to receive the maximum benefit. This number is not adjusted for inflation or future increases in premiums. With annual compound interest at an average of 4 per cent per year that $3,420 deposited each year would create about $354,400 in year 40. That capital would generate $14,176 in interest at that same 4 per cent per year or $676 more than the province is offering. The benefit of RRSPs, TFSAs and other forms of retirement savings for Ontarians is that they continue to own their capital and the income generated from it. Under this scheme the provincial government, which has failed to adequately fund their pensions will keep the capital they require Ontarians to give to them, while paying out less than even the interest on that capital would if left untouched and in private hands. Continuing to own the capital that is used to create investment income is critical for when unexpected events happen and need to be addressed. Often it is the difference between surviving a tight financial spot and being wiped out. The province is correct in noting that retirement savings are at an all time low, but to blame that on Ontarians not saving enough misses some key points as to why Ontarians aren't saving. Housing costs have increased well beyond the rate of inflation. Wages are largely stagnant, while the costs of putting your child through school has increased dramatically as has the kind of care elderly individuals whom are living longer tend to require. As a result, Canadians are heavily in debt and paying their mortgages off later in life. In fact, many Canadians expect to be in debt when they retire. For the ORPP to make sense, one would have to believe that Ontarians have 2 per cent of their income to put towards retirement savings but are simply choosing not to. It is hard to imagine this is the case considering we know so much about the financial pressures on families. With this in mind, depriving people of another 2 per cent of their incomes is not only the wrong thing to do, but might mean the difference between some families being able to make the minimum payments on their line of credit, vehicle or mortgage and could result in a far worse situation for some than the situation they are currently in. The Ontario Liberals have not proven themselves to be good fiscal managers and have demonstrated through a string of their appointments to rogue, scandal-ridden agencies that they don't even keep the best company to manage their "arms length" portfolios. This idea that somehow a government that is on the express route to defaulting on its own pension obligations is somehow the responsible party that will save others from ruin is preposterous. If Ontario does not want to see people coming up with ways to avoid participating in this latest cash grab scheme, they are going to need to demonstrate between now and 2017 they have at least a basic understanding of fiscal prudence and a plan to ensure they shore up their own shameful mismanagement of their pension obligations. Just as Tim Hudak was defeated on his plan to lay off 100,000 public sector workers, if the Liberals put the province on the course to defaulting on it's own pension obligations, they too will feel the wrath of everyone who loves a nurse, teacher, conservation officer, social worker or other public sector employee.